A boy from an East Cipinang trash dump slum in Jakarta, Indonesia shows his find. Poverty is a condition in which a person or community is deprived of, or lacks the essentials for a minimum standard of well-being and life. Since poverty is understood in many senses, these essentials may be material resources such as food, safe drinking water, and shelter, or they may be social resources such as access to information, education, health care, social status, political power, or the opportunity to develop meaningful connections with other people in society. Poverty may also be defined in relative terms. In this view income disparities or wealth disparities are seen as an indicator of poverty and the condition of poverty is linked to questions of scarcity and distribution of resources and power. Poverty is also a type of religious vow, a state that may be taken on voluntarily in keeping with practices of piety and the effort to come closer to God and the realm of spirit by denying the desires of the body. However it is defined, poverty naturally causes suffering because it involves the lack of something essential to human life. In the ideal, all people should be able to satisfy their needs and experience lives of health, happiness, and prosperity, not poverty. A homeless Frenchman in Paris. One possible cause of poverty is lack of material, which takes a number of forms. Natural factors such as climate or environment, combined with geographic factors can have a great affect. Geographic factors include access to fertile land, fresh water, minerals, energy, and other natural resources. Presence or absence of natural features helping or limiting communication, such mountains, deserts, navigable rivers, or coastline. Historically, geography has prevented or slowed the spread of new technology to areas such as the Americas and sub-Saharan Africa. The climate also limits what crops and farm animals may be used on similarly fertile lands. On the other hand, research has found that countries with an abundance of natural resources creating quick wealth from exports tend to have less long-term prosperity than countries with less of these natural resources. Inadequate nutrition in childhood in poor nations may lead to physical and mental stunting that, in turn, may lead to economic problems. Hence, this may be both a cause and an effect. For example, lack of both iodine and iron has been implicated in impaired brain development, and this can affect enormous numbers of people: it is estimated that 2 billion people (one-third of the total global population) are affected by iodine deficiency, including 285 million six to 12-year-old children. In developing countries, it is estimated that 40 percent of children aged four and under suffer from anemia because of insufficient iron in their diets. Disease, specifically diseases of poverty can make poverty even worse. AIDS, malaria, and tuberculosis among others overwhelmingly afflict developing nations, which perpetuate poverty by diverting individual, community, and national health and economic resources from investment and productivity.Further, many tropical nations are affected by parasites like malaria, schistosomiasis, and trypanosomiasis that are not present in temperate climates. The Tsetse fly makes it very difficult to use many animals in agriculture in afflicted regions. Economics offers a number of explanations for poverty. The first is poverty itself, which prevents (for example) various forms of investment. Also important is the inability to find a well-paying job, unemployment and/or underemployment. Many argue that globalization is having an adverse economic effect on poverty. These critics claim that globalization leads to economic exploitation of the developing world by rich countries. This alleged exploitation takes the form of sweatshops, overuse of land, and the use of monopoly power to exploit those without recourse to competitive services or products. Many claim that restrictions on free trade contribute to poverty, in particular, the very high subsidies to and protective tariffs for agriculture in the developed world. For example, almost half of the budget of the European Union goes to agricultural subsidies, mainly to large farmers and agribusinesses, which form a powerful lobby. Japan gave 47 billion dollars in 2005 in subsidies to its agricultural sector, nearly four times the amount it gave in total foreign aid. The US gives 3.9 billion dollars each year in subsidies to its cotton sector, including 25,000 growers, three times more in subsidies than the entire USAID budget for Africa’s 500 million people. This drains the taxed money and increases the prices for the consumers in developed world; decreases competition and efficiency; prevents exports by more competitive agricultural and other sectors in the developed world due to retaliatory trade barriers; and undermines the very type of industry in which the developing countries do have comparative advantages. Political factors influencing poverty can include lacking the rule of law, democracy, infrastructure, which is normally the responsibility of a sound government; lacking health care, which distracts citizens from participation in government; or lacking education, which likewise prevents entry into the realm of politics. Government corruption can also lead to poverty as citizens do not receive the benefits of their own taxes or of international aid organizations. Overpopulation and lack of access to birth control methods can lead to poverty due to some of the material limitations listed above. A country's status as a tax haven can contribute to poverty as well. These havens, which tax their own citizens and companies but not those from other nations and refuse to disclose information necessary for foreign taxation, can cripple their own peoples. The practice of not taxing foreign companies enables large scale political corruption, tax evasion, and organized crime in the foreign nations. Historical factors, for example imperialism and colonialism, Capitalism, Socialism, Communism, Monarchy, Fascism, and Totalitarianism have all been named as causes by scholars writing from different perspectives. For example, poorly functioning property rights is seen by some as a cause of poverty, while socialists see the institution of property rights itself as a cause of poverty. There exist many social factors leading to poverty on top of those previously listed. Lack of freedom and social oppression can lead to people being unable to take political or economic action to their benefit. Lack of social integration stunts the development of any productive social action groups, making it difficult to become involved in politics on a grand scale. The existence of slavery around the world prevents the accumulation of any wealth and has severe psychological repercussions for those forced into it. Crime, both white-collar crime and blue-collar crime can stunt economic growth as much as government corruption can, also leading to increased levels of poverty. War, including civil war, genocide, and democide can completely disrupt an economy, throwing all the participants at the margins into poverty. Another controversial phenomenon is the "brain drain" of intelligent people from developing countries moving to rich countries to pursue careers. On a more personal level, high levels of substance abuse, such as alcoholism and drug abuse prevent personal accumulation of wealth and can be general blights on society. Individual beliefs, actions, and choices may also be factors, as in the Christian ascetic tradition. Mental illness and disability, such as autism and schizophrenia, damage one's position in society and can prevent employment or accumulation of wealth. Finally, discrimination of various kinds, such as age discrimination, gender discrimination, racial discrimination can keep deserving, able people out of jobs and lock them into cycles of poverty. 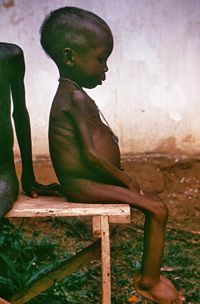 A starving female child during the Nigerian-Biafran war of the late 1960s. The abdomen is paradoxically swollen due to Kwashiorkor or severe protein malnutrition. Some effects of poverty may also be causes, as listed above, thus creating a "poverty cycle" and complicating the subject further. Some of these effects include Depression,  lack of sanitation, increased vulnerability to natural disasters, extremism of political views or actions, hunger, starvation, malnutrition, human trafficking, and increased suicides. Some of the larger society-wide effects include increased risk of political violence; such as terrorism, war, and genocide, homelessness, lack of opportunities for employment, high crime rate, low literacy, social isolation, loss of population due to emigration, increased discrimination, lower life expectancy and drug abuse. Map of world poverty by country, showing percentage of population living on less than one dollar per day. Unfortunately, information is missing for some countries. World map showing Life expectancy. World map showing the Human Development Index. World map showing the Gini coefficient, a measure of income inequality. 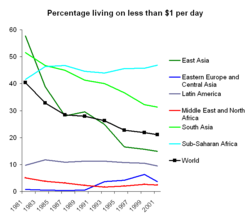 The percentage of the world's population living on less than $1 per day has halved in twenty years. However, most of this improvement has occurred in East and South Asia. The graph shows the 1981-2001 period. 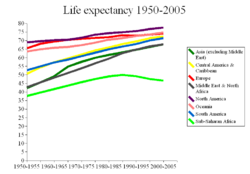 Life expectancy has been increasing and converging for most of the world. Sub-Saharan Africa has recently seen a decline, partly related to the AIDS epidemic. 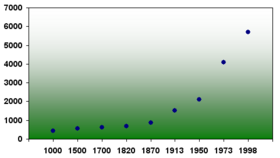 The graph shows the 1950-2005 period. Although the most severe poverty is in the developing world, there is evidence of poverty in every region. Poverty may be seen as the collective condition of poor people, or of poor groups, and in this sense entire nation-states are sometimes regarded as poor. To avoid stigma these nations are usually called developing nations. When measured, poverty may be absolute or relative. Relative poverty views poverty as socially defined and dependent on social context. In this case, the number of people counted as poor could increase while their income rise. A relative measurement would be to compare the total wealth of the poorest one-third of the population with the total wealth of richest 1 percent of the population. Absolute poverty refers to a set standard which is consistent over time and between countries. An example of an absolute measurement would be the percentage of the population eating less food than is required to sustain the human body (approximately 2000-2500 calories per day). The World Bank defines extreme poverty as living on less than US$1 per day, and moderate poverty as less than $2 a day. It has been estimated that in 2001, 1.1 billion people had consumption levels below $1 a day and 2.7 billion lived on less than $2 a day. The proportion of the developing world's population living in extreme economic poverty has fallen from 28 percent in 1990 to 21 percent in 2001. Much of the improvement has occurred in East and South Asia. In Sub-Saharan Africa GDP/capita shrank with 14 percent and extreme poverty increased from 41 percent in 1981 to 46 percent in 2001. Other regions have seen little or no change. In the early 1990s the transition economies of Europe and Central Asia experienced a sharp drop in income. Poverty rates rose to 6 percent at the end of the decade before beginning to recede. However, there are various criticisms of these measurements. Still, other indicators are also improving. Life expectancy has greatly increased in the developing world since WWII and is starting to close the gap to the developed world where the improvement has been smaller. Even in sub-Saharan Africa, the least developed region, life expectancy increased from 30 years before World War II to a peak of about 50 years before the HIV pandemic and other diseases started to force it down to the current level of 47 years. Child mortality has decreased in every developing region of the world. The proportion of the world's population living in countries where per-capita food supplies are less than 2,200 calories (9,200 kilojoules) per day decreased from 56 percent in the mid-1960s to below 10 percent by the 1990s. Between 1950 and 1999, global literacy increased from 52 percent to 81 percent of the world. Women made up much of the gap: Female literacy as a percentage of male literacy has increased from 59 percent in 1970 to 80 percent in 2000. The percentage of children not in the labor force has also risen to over 90 percent in 2000 from 76 percent in 1960. There are similar trends for electric power, cars, radios, and telephones per capita, as well as the proportion of the population with access to clean water. One third of deaths - some 18 million people a year or 50,000 per day - are due to poverty-related causes. That's 270 million people since 1990, the majority women and children, roughly equal to the population of the US. Every year nearly 11 million children die before their fifth birthday. 800 million people go to bed hungry every day. The World Bank's "Voices of the Poor," based on research with over 20,000 poor people in 23 countries, identified a range of factors which poor people consider elements of poverty. Most important are those necessary for material well-being, especially food. Many others relate to social rather than material issues. In politics, the fight against poverty is usually regarded as a social goal and many governments have — secondarily at least — some dedicated institutions or departments. World GDP per capita rapidly increased beginning with the Industrial Revolution. The anti-poverty strategy of the World Bank depends heavily on reducing poverty through the promotion of economic growth. However, some consider this approach does not actively or directly work to reduce or eliminate poverty. The World Bank argues that an overview of many studies show that growth is fundamental for poverty reduction, and in principle growth as such does not affect inequality, growth accompanied by progressive distributional change is better than growth alone, high initial income inequality is a brake on poverty reduction. Poverty itself is also likely to be a barrier for poverty reduction; and wealth inequality seems to predict lower future growth rates. The Global Competitiveness Report, the Ease of Doing Business Index, and the Index of Economic Freedom are annual reports, often used in academic research, ranking the world's nations on factors argued to increase economic growth and reduce poverty. Business groups see the reduction of barriers to the creation of new businesses, or reducing barriers for existing business, as having the effect of bringing more people into the formal economy. The 2007 World Bank report "Global Economic Prospects" predicts that in 2030 the number living on less than the equivalent of $1 a day will fall by half, to about 550 million. An average resident of what we used to call the Third World will live about as well as do residents of the Czech or Slovak republics today. However, much of Africa will have difficulty keeping pace with the rest of the developing world and even if conditions there improve in absolute terms, the report warns, Africa in 2030 will be home to a larger proportion of the world's poorest people than it is today. Governments can directly help those in need. This has been applied with mixed results in most Western societies during the twentieth century, in what became known as the welfare state. Especially for those most at risk, such as the elderly and people with disabilities, help can be monetary or as food aid. 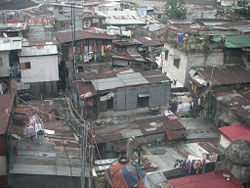 A shanty town in Manila, Philippines. Private charity is often formally encouraged within the legal system. For example, charitable trusts and tax deductions for charity. 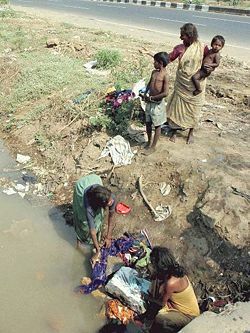 Poverty-stricken women washing clothes by a road in Mumbai, India. Most developed nations give foreign aid to developing nations and have produced Poverty Reduction Strategy papers or PRSPs.. Some think tanks and NGOs have argued, however, that Western monetary aid often only serves to increase poverty and social inequality. Supporters argue that the problems may be solved with better audits of how the aid is used. Also, aid from non-governmental organizations may be more effective that governmental aid; this may be because it is better at reaching the poor and better controlled at the grassroots level. Some argue for a radical change of the economic system. There are several proposals for a fundamental restructuring of existing economic relations, and many of their supporters argue that their ideas would reduce or even eliminate poverty entirely if they were implemented. Such proposals have been put forward by both left-wing and right-wing groups: socialism, communism, anarchism, libertarianism and participatory economics, among others. In his book The End of Poverty, world renowned economist Jeffrey Sachs laid out a plan to eradicate global poverty by the year 2025. Following his recommendations, international organizations began working to help eradicate poverty worldwide with intervention in the areas of housing, food, education, basic health, agricultural inputs, safe drinking water, transportation, and communications. The Poor People's Economic Human Rights Campaign is an organization in the United States working to secure freedom from poverty for all by organizing the poor themselves. The Campaign believes that a human rights framework, based on the value of inherent dignity and worth of all persons, offers the best means by which to organize for a political solution to poverty. 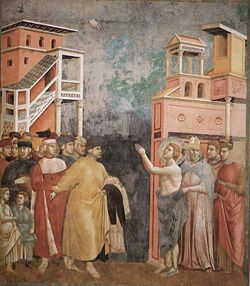 Saint Francis of Assisi renounces his worldly goods in a painting attributed to Giotto di Bondone. Among some groups, in particular religious groups, poverty is considered a necessary or desirable condition, which must be embraced in order to reach certain spiritual, moral, or intellectual states. Poverty is often understood to be an essential element of renunciation among Buddhists and Jains, whilst in Roman Catholicism it is one of the evangelical counsels, and taken as a vow among certain religious orders. The way poverty is understood among these orders takes a variety of forms. For example, the Franciscan orders have traditionally forgone all individual and corporate forms of ownership. However, while individual ownership of goods and wealth is forbidden for Benedictines, following the Rule of Saint Benedict, the monastery itself may possess both goods and money, and through history some monasteries have become very wealthy indeed. In this context of religious vows, poverty may be understood as a means of self-denial in order to place oneself at the service of others; Pope Honorius III wrote in 1217 that the Dominicans "lived a life of voluntary poverty, exposing themselves to innumerable dangers and sufferings, for the salvation of others." However, following Jesus' warning that riches can be like thorns that choke up the good seed of the word (Matthew 13:22), voluntary poverty is often understood by Christians as of benefit to the individual - a form of self-discipline by which one distances oneself from distractions from God. ↑ Jere R. Behrman, Harold Alderman and John Hoddinott.Hunger and Malnutrition 'Copenhagenconsensus.com. Retrieved October 14, 2007. ↑ Poverty Issues Dominate WHO Regional Meeting World Health Organization.Retrieved October 14, 2007. ↑ Oxfam: Stop the dumping!. Retrieved October 14, 2007. ↑ OECD Producer Support Estimate By Country. Retrieved October 14, 2007. ↑ OECD Development Aid At a Glance By Region. Retrieved October 14, 2007. ↑ Cultivating Poverty The Impact of US Cotton Subsidies on Africa. Retrieved October 14, 2007. ↑ Six Reasons to Kill Farm Subsidies and Trade Barriers. Reason. Retrieved October 14, 2007. ↑ Ending Mass Poverty by Ian Vásquez. Retrieved October 14, 2007. ↑ Morton Halperin, Joseph T. Siegle, Michael M. Weinstein, and Joanne J. Myers. The Democracy Advantage: How Democracies Promote Prosperity and Peace Retrieved October 14, 2007. ↑ Global Competitiveness Report 2006 World Economic Forum. Retrieved October 14, 2007. ↑ Hossein Jalilian and John Weiss. 2004. Infrastructure and Poverty Reduction: Cross-country Evidence Retrieved October 14, 2007. ↑ Transparency International FAQ. Retrieved October 14, 2007. ↑ Nick Mathiason Birth rates must be curbed to win war on global poverty The Independent. 31 January 2007. Retrieved October 14, 2007. ↑ Western bankers and lawyers 'rob Africa of $150bn every year. Observer. Retrieved October 14, 2007. ↑ Tirfe Mammo. The Paradox of Africa's Poverty: The Role of Indigenous Knowledge, Traditional Practices and Local Institutions - The Case of Ethiopia. (Red sea Press, 1999. ISBN 1569020493) Gives credit to imperialism/colonialism as a cause as one of two major schools of thought. ↑ Long-Run Development and the Legacy of Colonialism in Spanish America. Retrieved October 14, 2007. ↑ Reflections on Colonial Legacy and Dependency in Indian Vocational Education and Training (VET): a societal and cultural perspective by Madhu Singh. Retrieved October 14, 2007. ↑  accessdate 2007-01-17 U.S. Chamber of Commerce Fact Sheet"
↑ Vikram Patel. "Is Depression a Disease of Poverty?" Regional Health Forum WHO South-East Asia Region 5 (1) World Health Organization. ↑ Eduardo Lopez Moreno and Rasna Warah. Urban and Slum Trends in the 21st Century The State of the World's Cities 2006/2007 UN Report. Retrieved October 14, 2007. ↑ Lack of Toilets a Problem for the Poor, U.N. Says By CELIA W. DUGGER. New York Times November 9, 2006. Retrieved October 14, 2007. ↑ P.K. Freeman, M. Keen, M. Mani - 2003. Dealing with Increased Risk of Natural Disasters: Challenges and Options. ↑ Social Protection and Risk Management at worldbank.org. Retrieved October 14, 2007. ↑ Worldbank.org reference. Retrieved October 14, 2007. ↑ Institute of Social Analysis. Retrieved October 14, 2007. ↑ Guy Pfeffermann. The Eight Losers of Globalization TheGlobalist. Retrieved October 14, 2007. ↑ Charles Kenny " Why Are We Worried About Income? Nearly Everything that Matters is Converging" World Development 33 (1) (January 2005): 1-19, Retrieved October 14, 2007. ↑ The World Bank's "Voices of the Poor". Retrieved October 14, 2007. ↑ PovertyNet worldbank.org. Retrieved October 14, 2007. ↑ Poverty, Growth, and Inequality worldbank.org. Retrieved October 14, 2007. ↑ The Doing Business database A member of the World Bank Group. Retrieved October 14, 2007. ↑ WORLD BANK HAS GOOD NEWS ABOUT FUTURE By ANDREW CASSEL The Philadelphia Inquirer. Dec. 30, 2006. Retrieved October 14, 2007. ↑ UN Millennium Project. Retrieved October 14, 2007. ↑ Poverty Reduction Strategy Papers (PRSP) from the IMF. Retrieved October 14, 2007. ↑ Thalif Deen. Tied Aid Strangling Nations, Says U.N. Inter Press Service IPS. Retrieved October 14, 2007. ↑ Myth: More Foreign Aid Will End Global Poverty ABC News. Retrieved October 14, 2007. ↑ Does Foreign Aid Reduce Poverty? Empirical Evidence from Nongovernmental and Bilateral Aid ABC News. Retrieved October 14, 2007. Diamond, Jared M. Guns, Germs, and Steel: The Fates of Human Societies. New York: W. W. Norton & Company, 1999. Catholic Encyclopedia "Poverty and Pauperism"
This page was last modified on 27 May 2015, at 20:57.